I am a big fan of Dave Ramsey, who is a financial management guru famous for his radio show and bestselling books. His style is to give tough love to people, not allowing them to make excuses for their financial situations. His message is well-received because it’s simple: get debt-free, live debt-free, build wealth slowly, and after you’ve succeeded, give lots of it away. One of his primary messages is a principle that is so simple, it’s profound: If you want to be rich, do what rich people do (do “rich people stuff” as he says). If you want to stay poor, keep doing what poor people do. If you are broke, you will become rich when you do rich people stuff with your money. Find out what the habits of rich people are and do them, and you will become one of them. How do I know this? Seventy-eight percent of America's millionaires are first- generation rich. They started with nothing and became millionaires. If you do poor people stuff with your money, you will become poor people. If you are rich and you do poor people stuff with your money, you will become poor people. "Rich" isn't an amount of money; it's a mindset in how you live. I've been broke, but I've never been poor because when I was broke, I just had no money. It wasn't that I had no hope. It wasn't that I didn't believe I could win. It wasn't that I was unwilling to sacrifice. What is “rich people stuff?” He shares many examples that come from research and studies about millionaires. They work their tails off to get out of debt, and then pay cash for everything. They invest wisely and patiently. They buy used cars with cash instead of new ones with loans. And they live frugally. This goes against conventional wisdom, doesn’t it? Rich people either inherit their money or lie and cheat to get it, right? Not according to the research. They have very distinct behaviors and make very thoughtful decisions. Stuff that poor people do includes things like living by credit cards, payday loans, adding debt upon debt, not saving, and frivolous spending. So, while our emotions may say that it’s unfair that rich people are that way, our logic should tell us that if we make the right choices and behave in a disciplined way, we can join them. But, like rich people, we tend to demonize strong fraternities. We hate them for all the awards they win, all the recruits they get, and all the attention they receive. Instead of learning from them, we dismiss their success (yet secretly hope we have the same). Let go of your envy or jealousy about the highly successful fraternities, and start observing what they do. You can be right there with them. One of the benefits of a Greek system is that we see several examples of how to do fraternity happening at once. In any given Greek system, we see the range of success, from chapters that are failing completely to those that are knocking the ball out of the park. There is no cap on how many successful fraternities there can be. The problem is, too many of us choose to just be mediocre, because like many people, we’re just waiting to win the lottery or for some other stroke of ridiculous good luck. Wealth isn’t built that way. Neither is organizational success. It’s an old but true quote – don’t wait for your ship to come in. Swim out to it. Strong fraternities are extremely discerning in recruitment. So much so, that they have a very low pledge dropout rate. They pick the right guys from the start. Strong fraternities are quick and nimble. For example, when a natural disaster strikes, they have tables set up within hours to collect donations and a van full of members heading towards the relief efforts. Strong fraternities practice and perform the Ritual ceremonies with precision. They treat membership initiation with the same reverence that new colonies do. Strong fraternities care about presence. They strive to look impressive and act confidently when showing their public persona. 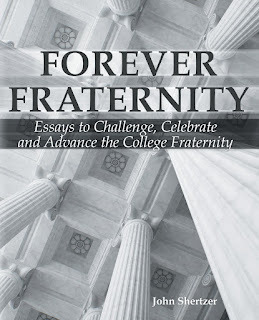 Strong fraternities have high chapter GPA’s because they recruit high academic performers. They realize that recruiting a low performer and thinking they can change him/her is unrealistic. Strong fraternities do not take shortcuts in recruitment. It’s person-to-person, time consuming, focused work. They know it’s their lifeblood as an organization and they prioritize it that way. The list goes on. The main point here is that a strong fraternity is not something to ignore. Or complain about. Or hate. It’s something to observe, study, and possibly emulate. Fraternity success is not by accident. Nor is fraternity failure. Choose your examples wisely. This essay was originally posted in August 2012 and has been updated.